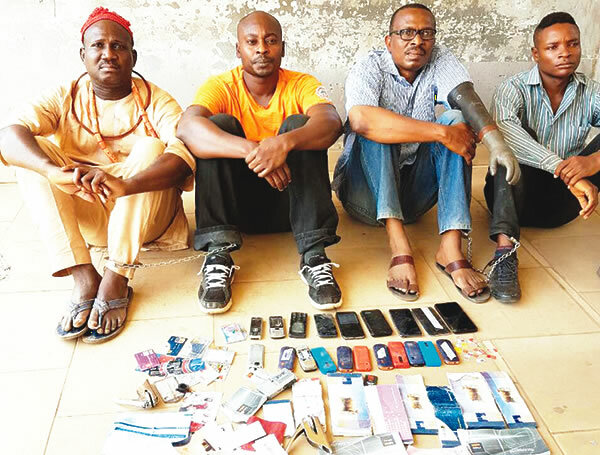 Political impersonators, some suspected fraudsters, who specialised in cloning phone numbers of ministers, politicians and aides to President Muhammadu Buhari, have finally been apprehended by the police. The suspects were identified as Chief Ovie Ogogo, 47; Abdulazeez Eragbe, 40; Babatunde Oshamoto, 49; and 25-year-old Samuel Idah. Fourteen phones with SIM cards allegedly registered with names of top government officials were reportedly recovered from the Political impersonators suspects. Among those impersonated by the syndicate, according to the police, are Chief of Staff to the President, Abba Kyari; the National Security Adviser, Babagana Moguno; the Minister of State for Petroleum Resources, Ibeh Kachukwu; and the Minister of Finance, Mrs. Kemi Adeosun. They were also accused of impersonating a national leader of the All Progressives Congress, Asiwaju Bola Tinubu; the Senate President, Bukola Saraki; the Minister of Transport, Rotimi Amaechi; and the Secretary to the Government of the Federation, Babachir Lawal. PUNCH Metro learnt that operatives of the Inspector-General of Police, led by ACP Abba Kyari, trailed the syndicate to a hotel in Kaduna State on Tuesday, after receiving complaints from some victims. A police source disclosed to one of our correspondents that the suspects impersonated Moguno to collect N13m from a Ghanaian, who wanted to get an oil block in Nigeria, and posed as Lawal to swindle one Nnamdi Udo of N4m under false pretences of helping him to get a federal appointment. “They also posed as the Chief of Staff to the President and collected N2.5m from one Mr. Bishop, who was looking for a contract, and another N700,000 from one Shehu Dan Yahaya, who was seeking a federal appointment. “Ogogo, a native of Omoku Rivers State, impersonated prominent citizens from the South-South and South-East; Eragbe impersonated prominent persons from the North; Oshamoto posed as prominent citizens from the South-West and North-Central; while Idah supplied them SIM cards registered with the names of the top government officials. “They were arrested in a luxury hotel in Kaduna and had confessed to impersonating several prominent citizens,” the source added. Another senior police officer disclosed to PUNCH Metro that the suspects confessed to have realised N20m in six months from their criminal activities. He added that the mastermind of the gang was based in the United Kingdom. He said, “Ogogo is their leader; but they mentioned one Prince Maurice, based in the UK, as their gang leader. Fourteen different phones, several registered SIM cards, and a diary containing phone numbers of several top government officials, were recovered from the suspects. Parading the suspects on Thursday in Abuja, the police spokesman, Jimoh Moshood, said all the suspects confessed to the crime. He said, “On March 23, 2017, the Intelligence Response Team arrested these notorious criminals who posed as top government functionaries. The police said other suspects would soon be arrested, while those in custody would be arraigned in court at the conclusion of investigation.